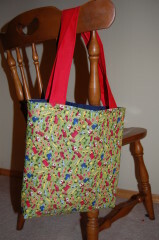 It looked like a great, simple use of some of the scrap fabric I have, and my kids love totes, so I gave it a try. Overall, it’s a quick and easy tutorial, but I have a few comments and recommendations to make it a little better. First, the author does not specify her seam width that I recall, which I figured out to be 1/2″, based on how she did her corners. 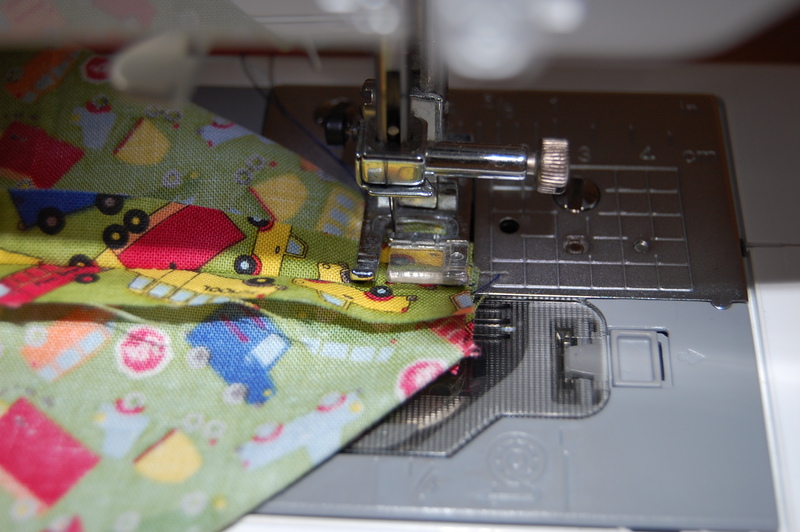 Top-stitching width isn’t as important, I usually do mine at 1/4″. Because I was working with scrap fabric, I didn’t have any pieces that were 44″ long, so I just cut two 4″ x 22″ straps, instead of one long 4″ x 44″ one to cut in half afterward. 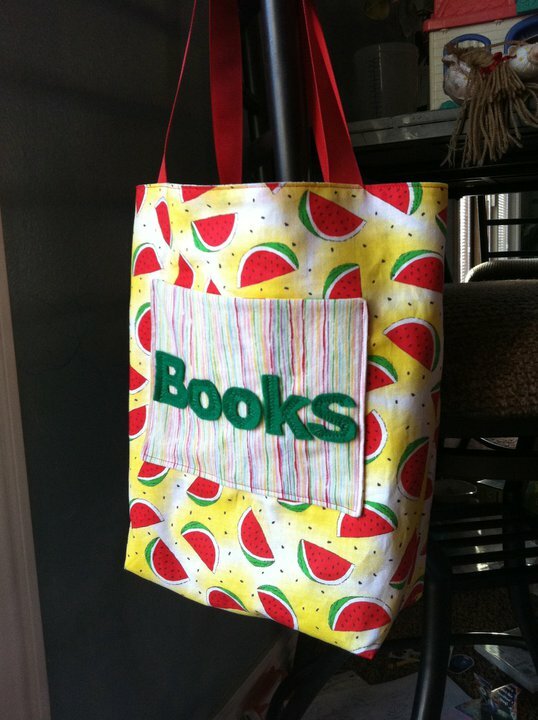 Though that would probably shave a few seconds off of the time it takes to make the bag if you have enough to do it that way. 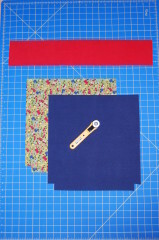 Now you proceed as in the tutorial, taking two bag pieces and placing them with the right sides together, stitching down each side and then along the bottom, as shown below. 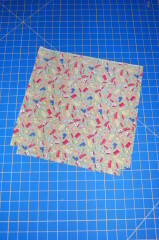 Now you still do the same as in the tutorial for the corners, “pinching” the sides to sew across. 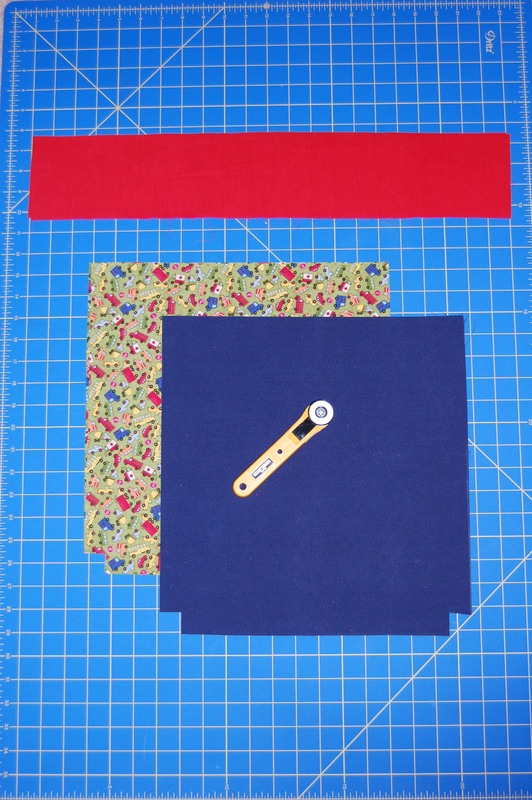 But with the notches cut, it’s just a matter of matching the raw edges and sewing a 1/2″ seam, instead of have to measure and sew. 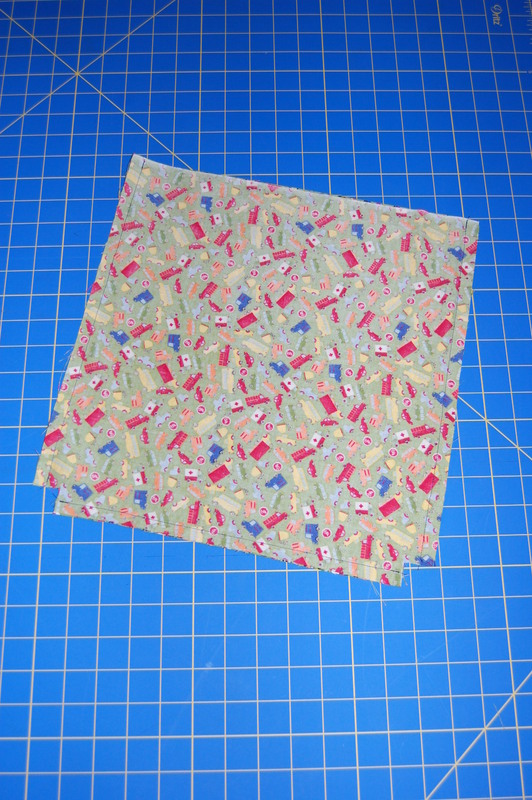 The pictures below try to illustrate step-by-step what I’ve done to create the corner seams, and you can click to enlarge them. 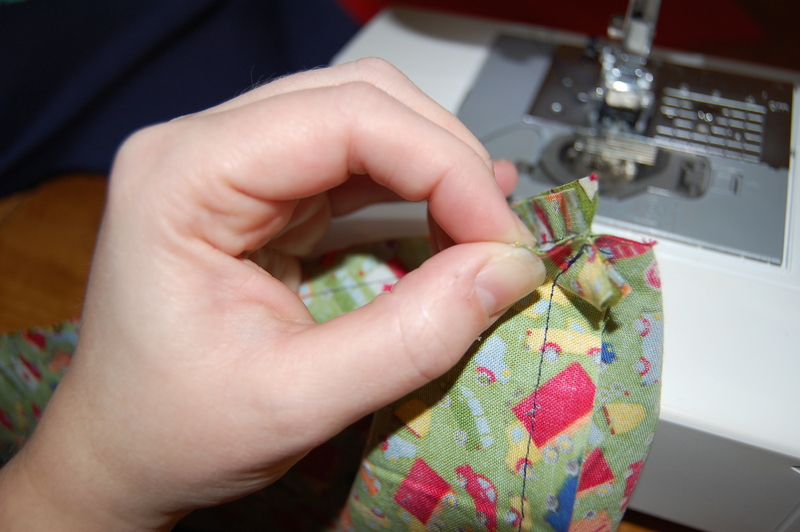 Start by pinching the fabric at the corner to pull it open. 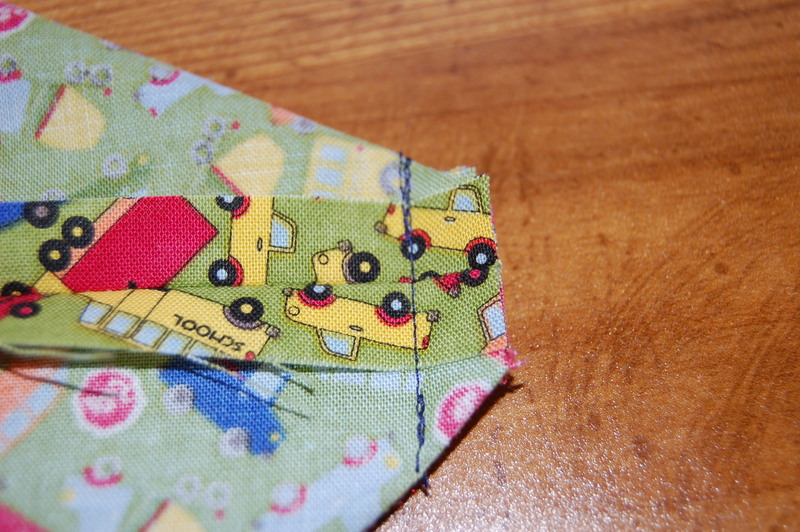 Using both hands (one of mine was holding the camera), you pull the fabric to line up the raw edges as well as the seams. 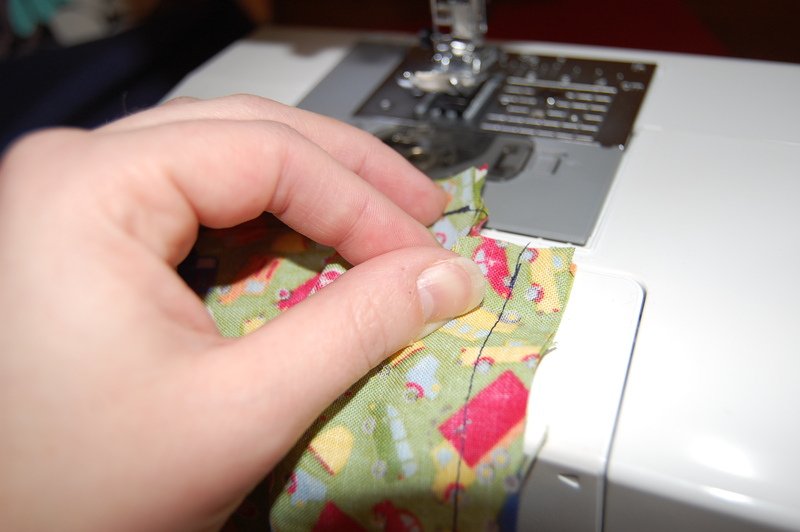 Open the seams if necessary, and lay flat to sew 1/2″ seam across the raw edge. 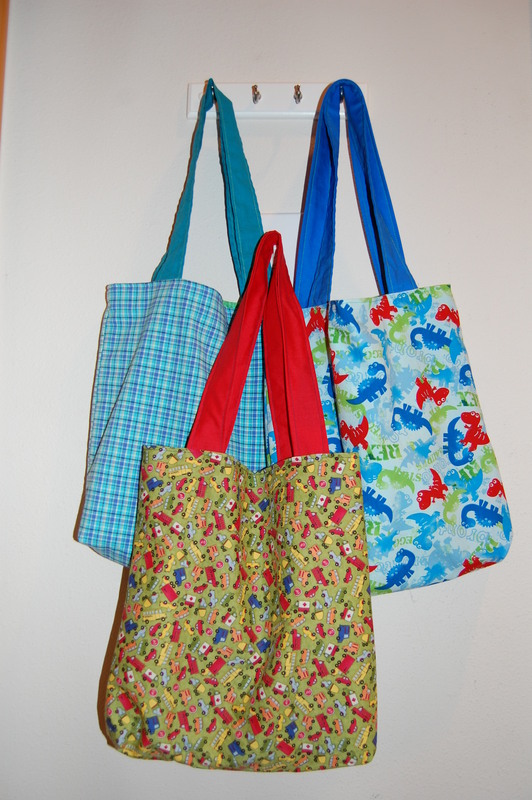 So, aside from changing how the corners are sewn (which is entirely up to you if you find my way easier or harder), I followed the tutorial and made up three great little bags for my kids. Each bag took 1/2 hour to complete. Some variations would be to use grosgrain ribbon for the handles which would save even more time, which a friend of mine did and it looked very nice, or add pockets or embellishments. 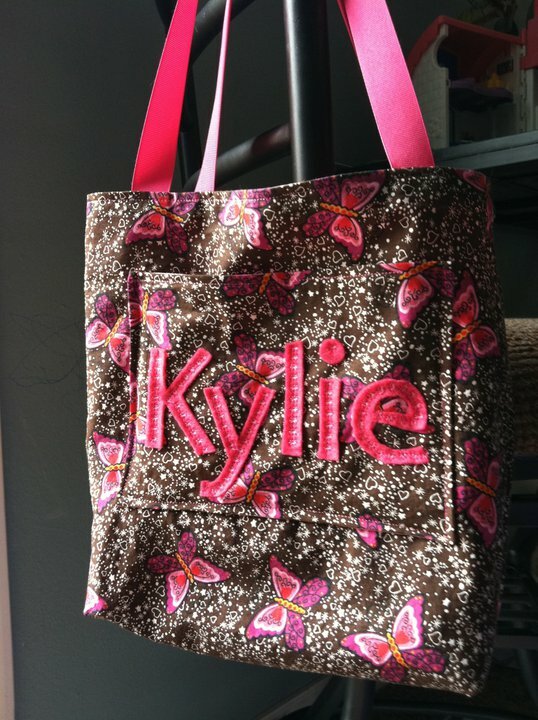 Here are my friend Nicole’s bags, to give you an idea of the ways you can embellish and personalize them.